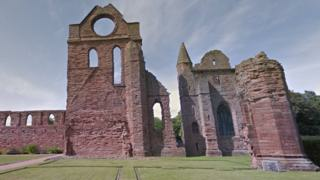 Police are appealing for information after a 22-year-old man was attacked by a gang outside Arbroath Abbey. The man was approached and assaulted by five or six men near the abbey's visitor centre at about 15:45 on Thursday. Officers said the man was not badly hurt, but sustained cuts and bruises to his face. The victim managed to escape after a woman walked through the abbey archway and interrupted the incident. No descriptions of the suspects have been issued, but Police Scotland said it was following a "positive line of inquiry."